When we think of Anna Sui, one image comes to mind: rock ‘n’ roll boho goddess. And it’s clearly reflected in her cosmetics range. Featuring elaborately carved black crystal packaging and fragrances that have the ability to stop people in their tracks, the Holiday 2014 offerings are of the must-have variety. In Toronto to introduce the collection, as well as a few spring offerings (look out for some slightly glittery coral lipsticks and sheer colours that will accent sun-kissed skin), Anna sat down with us to talk holiday trends and can’t-live-without items. theFashionSpot: What was your inspiration for the holiday collection? Anna Sui: I love fairy tales. And I was thinking about Hansel and Gretel, and wanted to make tempting sweets that look like chocolates and mousses. In the nail polish, we introduced chocolate chips so it looks like mint chocolate chip ice cream, which we made using opaque spots in the polish. It’s a new technology that I hadn’t seen before. tFS: What inspires you when developing your fragrances? AS: All Anna Sui fragrances are aspirational and draw from hopes and feelings. And with the new La Nuit de Bohème, we thought we’d put fashion behind it. 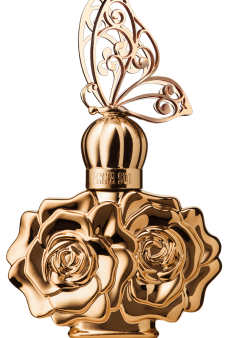 Last year, we introduced La Vie de Bohème and used bohemian style, which is the Anna Sui signature, as the spirit behind the fragrance. With this one, we took her into the evening and made her a golden bohemian princess. This is a stronger, more exotic fragrance with more character. tFS: How does your fashion aesthetic translate to your cosmetics? AS: Every product that Anna Sui does is taken from the world of Anna Sui, which comes from fashion. So every collection has its own colour story and inspiration. Fall 2014 was inspired by Chinoiserie; Spring 2015 was inspired by psychedelia and English rock bands from the 1960s and 1970s. The objective is that a nail polish or a tube of lipstick has to have the same fantasy as an Anna Sui dress. A customer may not have the availability or the budget to buy an Anna Sui dress, but she’ll always have that same fantasy and thrill in the cosmetics. And that’s why I’m so obsessive with the packaging. Every box is irresistible and has the characteristic Anna Sui design on it. It’s the same with the containers themselves. They feel like collectibles. tFS: What’s your favourite product from the holiday collection? AS: La Nuit de Bohème fragrance. I fell in love with the strength and the drama of the scent. tFS: Why did you decide to launch a cosmetics line? AS: I always loved cosmetics and when I was approached with the idea, they said they wanted to make a cosmetics line that would be more of an accessory and not just a beauty line. And I loved that concept. The first product I asked for was a red lipstick. So we developed the 400 lipstick, which is a deep red with blue undertones. It’s now the signature item of the line. tFS: What’s your can’t-live-without beauty product? tFS: What can no woman live without come holiday? AS: That’s when you can dress up a bit, and it’s the time to introduce more drama or glitter.